One of my roles as a reviewer is to monitor the Eastern England region for caches that appear to require maintenance. I am regularly notified by Geocaching HQ of the caches that they have identified as being in need of some attention. It would appear that this cache may benefit from some attention by the cache owner as it has not been found for a while. May I ask that you check the cache to confirm it is still in situ and/or deal with any maintenance required and/or give an indication of when it may be up and running again for people to find. If the Cache Owner has visited the cache recently, then please post an Owner Maintenance log indicating that you have done so. You can then enable the listing and all should be fine. Sadly if there is no response to this log after 30 days I will have to archive the cache. 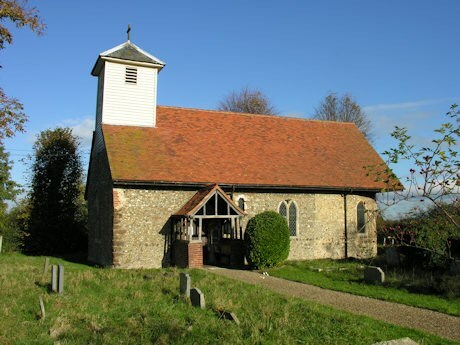 In 1365 the dedication of Little Tey Church was to St Mary but by 1522 it had been changed to St James-the-Less. It stands a short distance from the A120 trunk road. It is bounded by agricultural land to the east and by modern houses to the west. The former rectory of the parish, now a private residence, is a fine building with a varied history and is located in Great Tey road a short distance away, Little Tey church is part of a united benefice which includes Great Tey and Wakes Colne and Chappel. The Victorian rectory (1856) at Great Tey serves as a parsonage house. The Church building is a conspicuous example of early Norman architecture and shares similar features with Great Tey and Wakes Colne which are of like date. 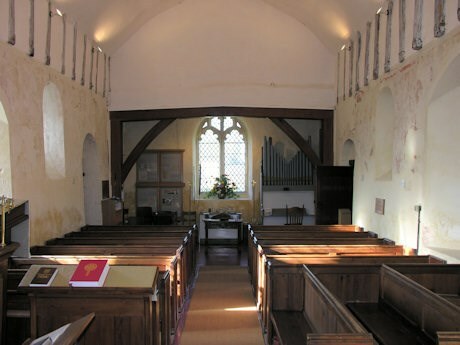 The church comprises a single cell nave and chancel with apsidal end, with a south porch of 19th century construction and a north vestry, probably early 20th century in date. The church is simply furnished with pews, font, pulpit and holy table. Its principal feature is the extensive wall paintings. The windows are all clear except for a small piece of the 15th century coloured glass in the east window. 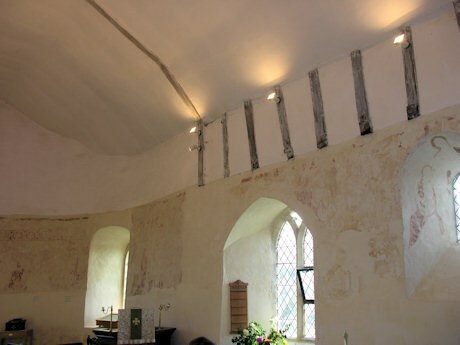 The apse contains an original north east window and there are also original windows on both sides of the nave. More windows were inserted in the 14th century. Outside the church, the churchyard is still used for the burial of the parishioners and has recently been preserved by the Parochial Church Council as a place of special environmental interest with many rare wild flowers finding a place of a sanctuary. 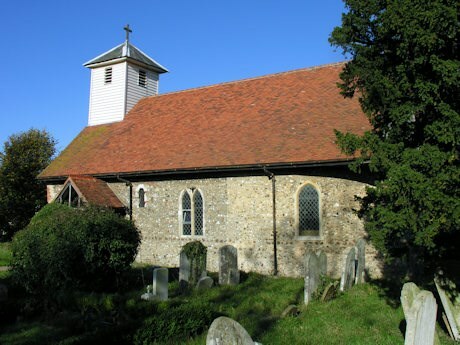 In July 2001 a survey report of the churchyard was produced by the Essex Churchyards Conservation Group I reports that the churchyard At Little Tey is a good example of undisturbed grassland containing several species of wild flowers that are no longer common in the Essex countryside. Some 107 different species of plants and trees are listed as present in the churchyard in the 2001 E.C.C.G. 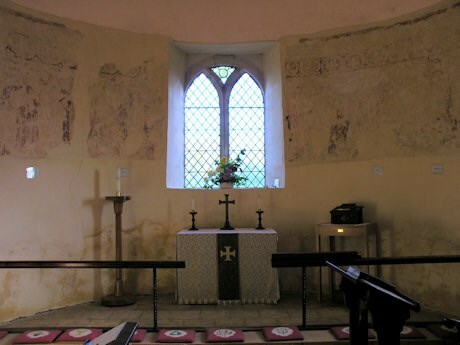 The Medieval Wall Paintings on the interior of the Church. A very important and high quality Passion Cycle discovered only in 1970. The church is apsidal, and paintings - the Passion Cycle itself and a few others - are on all the walls including the curved walls of the apse itself. They are now unfortunately very faint, many to the point of indecipherability. On the north wall from the west (left), the visible parts of the Cycle begin with the Last Supper. Peter is discernible, and John, who is painted leaning ‘in Christ’s bosom’. Judas is alone on the opposite side of the table, as is common. Next comes the Washing of Feet (photo, showing fairly clearly the towel girded around Christ’s waist, and faint traces of one of the disciples, probably Peter, sitting at a slightly right), higher level to the right. This scene is to the right of the second window shown at the left in the upper photograph. Next in the sequence, curving around the apse, are the Arrest in Gethsamene, followed by the Road to Calvary (or perhaps the Flagellation), the Crucifixion (with John, Longinus and Stephaton just visible), and the Entombment (very little left). The apse meets the south wall at this point with paintings of the Harrowing of Hell and the Appearance to Mary Magdalene, both comparatively rare subjects. This completes the Passion Cycle as we have it. 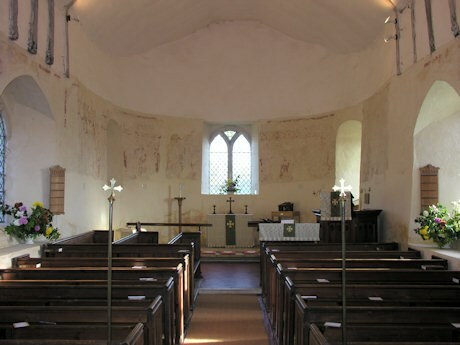 It is to be hoped that no heavy-handed restoration takes place at Little Tey, but the paintings need, and certainly deserve, careful conservation nevertheless. The cache is a small Tupperware box slightly “camouflaged” containing a note book, pencil and pencil sharpener. There is room in it for small TB’s. Please sign the log book or leave a calling card. Please replace the container as found and beware of Muggles on the road and the local houses. The approach road is very quiet and a no-through road, only really gets busy when the Church Services are on, their is a carpark next to the church. If you do arrive by car/bike etc be aware of the Junction when pulling back out onto the A120. Congratulations for not being beaten by the Usual suspects in the race for FTF!